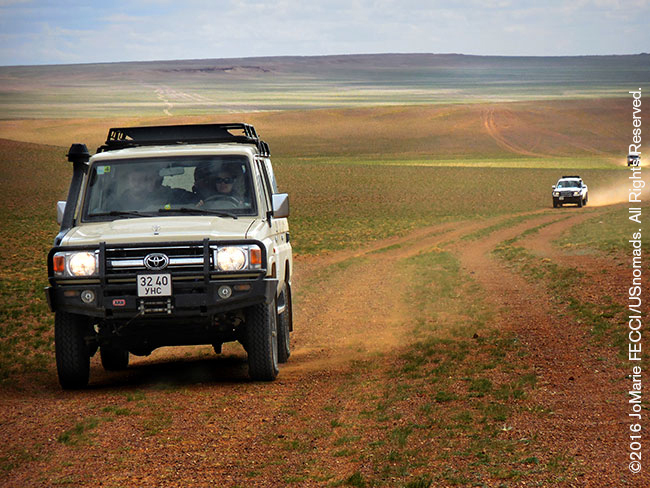 Heading south out of Ulaanbaatar, the route into the Gobi begins on a long straight stretch of pavement. Getting an early start was key to avoiding UB’s paralyzing traffic jams. And our team vehicles were actually staged on the outskirts of town because one complication of driving in the city center is the system of “alternate driving days” that the local government uses to try to solve the traffic problem. This system, enthusiastically enforced by the police, is based on a vehicle’s license plate number–with different days off limits for different numbers. If a vehicle is caught on the road on a day its number is prohibited the driver WILL get a fine. Leaving the edges of the urban environment behind, the transition to rural was fast. The traffic seemed to melt away and the tar road opened up onto the vastness of a timeless landscape. The geography of Mongolia is varied, with the Gobi Desert to the south and with cold and mountainous regions to the north and west, but much of the nation consists of “steppe,” huge rolling plateaus that seem to go on forever. Technically, a steppe is an ecoregion characterized by grassland plains without trees. 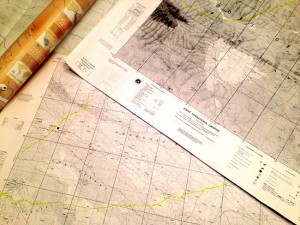 It may be semi-desert, or covered with grass or shrubs or both, depending on the season and latitude. The term is also used to denote the climate encountered in regions too dry to support a forest, but not dry enough to be a desert. The Eurasian steppe, extending from Hungary to China, is the largest temperate grassland in the world, reaching almost one-fifth of the way around the Earth, according to National Geographic. Historically it was one of the most important trade routes, with caravans of horses, donkeys, and camels crossing the flat expanse between Asia and Europe for thousands of years along what became known as the “Silk Road.” The great Mongolian leader Chinggis Khan conquered almost the entire Eurasian steppe during the 13th century, bringing political stability to the Silk Road, and not long after, the Venetian explorer Marco Polo became one of the first Europeans to travel across the steppe to China. The days of great caravans and cross-roads of civilization seem far off as we drive across this endless stretch of mostly flat terrain with no identifiable features on the horizon. It is much greener than I had imagined. Thick grass seems almost lush in some places, while other sections are sparser. And in contrast to expectations of a harsh desolate environment, it seems vibrant with life. There are animals everywhere. Short grasses that grow naturally on steppes provide grazing for cattle, goats, horses, camels, and sheep–the traditional herd animals referred to here as the “five snouts.” Herding is important in Mongolia. And the nomadic herders here are not marginalized quaint reminders of a simpler time — there are over a million of them and they are the foundation of the nation’s economy. Apart from the mineral extraction industry, Mongolia’s chief exports are meat products and wool. Picturesque herds of sheep and goats roam freely along the roadside, and horses kick up dust in the distance. Sometimes the animals spill out onto the highway and can become a serious traffic hazard. The goats, particularly, have a habit of just darting out without warning. Experienced local drivers seem to know how to “herd” the animals with their vehicles, but we just stop and let them pass, using the time for a photo opportunity. The driving itself is easy, as we are going due south on a paved highway for most of the day, but with an estimated drive time of roughly five hours, chasing the vastness of the steppe can get a bit tiresome once the initial wow effect of the awe inspiring landscape fades. The team started to call out animal sightings over the radio as the miles slowly rolled by. “Horses at 10 o’clock” and such got a bit more exciting when it became “gazelles at 9 o’clock” — except the gazelles were so fast that by the time we could look they were at “2 o’clock.” Tiny specks running at warp speed across the horizon, it was almost hard to confirm they were gazelles without binoculars. A single police car on the side of the road acts as a checkpoint of sorts, but does not stop our convoy, and in fact this will be the only security presence we will see during our journey. Mongolia does not have any significant “security” issues and there is little police or military activity apparent outside of UB. Mandalgovi is a small town, mostly flat and spread out, with a few tall buildings that look like they may be left over from the Soviet era. Lots of low residential compounds mixed with some shops and administrative buildings in the center. We stopped only long enough to purchase some supplies and take the opportunity to top off gas. We still had another hundred miles to drive, and with animals crossing and photo stops, it had taken us longer than expected to get this far. 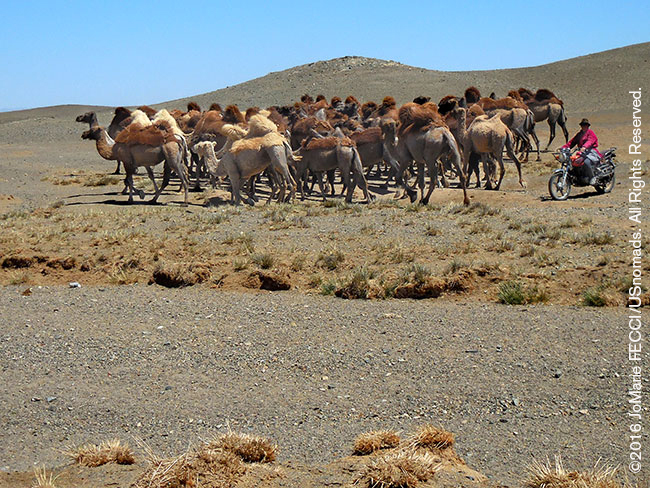 Gobi rangelands are fragile and are easily destroyed by overgrazing, which results in expansion of the true desert, a stony waste where not even Bactrian camels can survive. This is the region where the nomadic herders involved with the Mongolian Bankhar Dog Project live. Despite growing urbanization, approximately 30% of the nation’s population remains nomadic or semi-nomadic. Traditionally families moved frequently with their herds in search for new pastures, but today most are semi-nomadic — meaning they move from one specific location to another specific location at the change of the seasons. 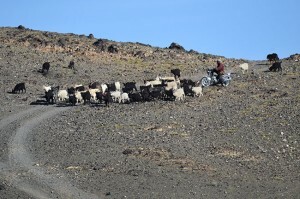 The herders’ lifestyle has become increasingly precarious due to the combined effects of climate change, growing populations and overgrazing. Desertification pushes them further in search of grazing lands, right into the territory of the snow leopards and wolves. Meanwhile, populations of the native antelope, the traditional prey of large predators like wolves and snow leopards, are decreasing because of depleted grasslands and habitat destruction. Depopulated antelope mean that large predators searching for food prey on livestock herds. Livestock losses can be catastrophic for households. Families often lose up to 40% of their annual income to predation, creating an untenable situation. Pressure from predators forces the herders to keep higher density herds, which increases over grazing even more, perpetuating a vicious spiral. Between grassland loss, climate change and predator pressure, families are forced to struggle to exist on a daily basis or chose to leave their traditional way of life behind. 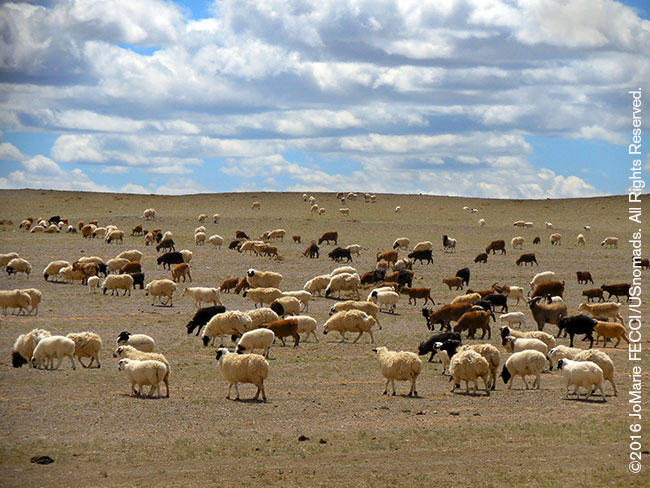 According to a report from UNEP, almost 90% of Mongolia’s pastureland is vulnerable to land degradation and desertification. A recent assessment of desertification in Mongolia shows that among the land assessed, 5% are very severely, 18% severely, 26% moderately and 23% slightly degraded. This means almost all grasslands are under threat of desertification and roughly 72% of the total territory is degraded to some extent. The sky was slightly overcast and the wind was blowing gently when we finally turned off pavement onto dirt, some 250 miles southwest of UB. A small herd of Bactrian camels looked majestic in the afternoon light, their long hair fluttering with the breeze. 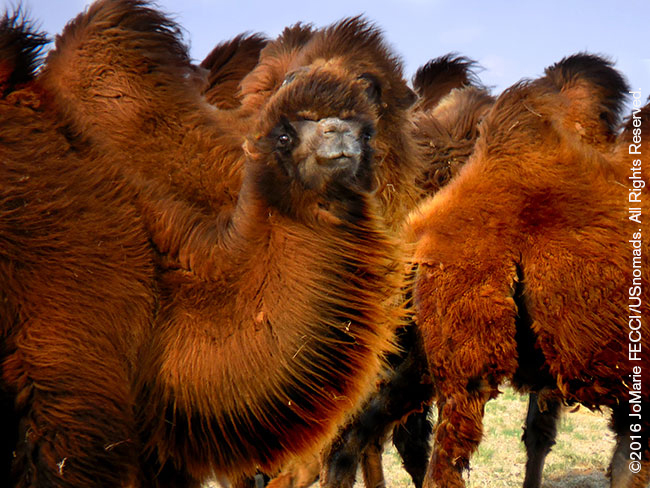 Unique to the steppes of central Asia, these two humped camels have a tolerance for cold, drought, and high altitudes that made them the favored pack animal for the ancient Silk Road caravans. Our modern caravan of assorted trucks passed them by, continuing towards what looked like a small hill in the distance. The “hill” grew larger as we approached, driving into a passage around it that led to our “ger” camp. The distinctive round white gers were arranged in neat lines with military precision, their doors all facing south, according to tradition. The ger is a comfortable and practical dwelling for this environment, and there are a number of these encampments set up for travelers in the backcountry — kind of like nomad “motels.” It was still light as we settled into our home for the night, with the vastness spread out before us — its rough, rugged beauty just hinting at the epic landscapes we would be driving into. 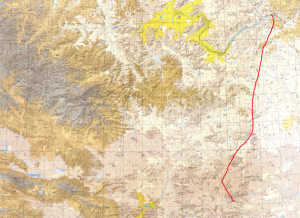 This map shows the progress of the expedition team overall as we work our way clockwise in a loop southwest from the capital. 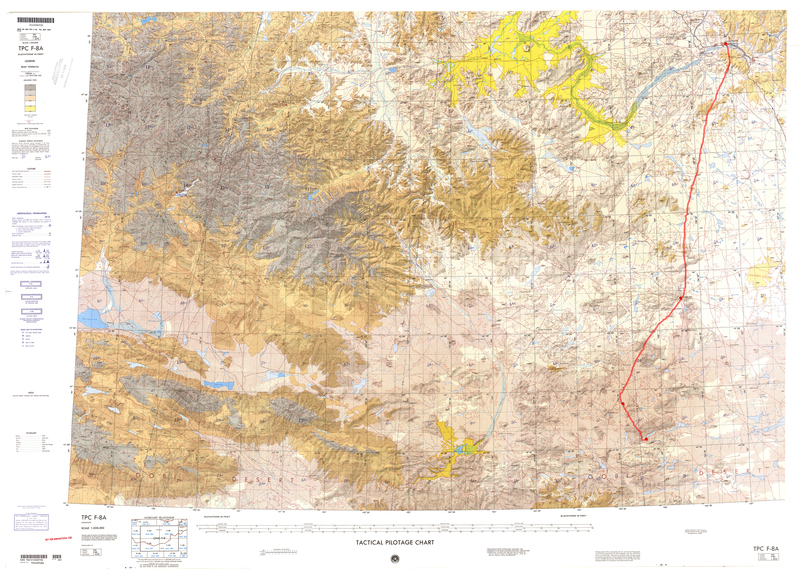 Today’s segment, 280 miles, is shown in red. 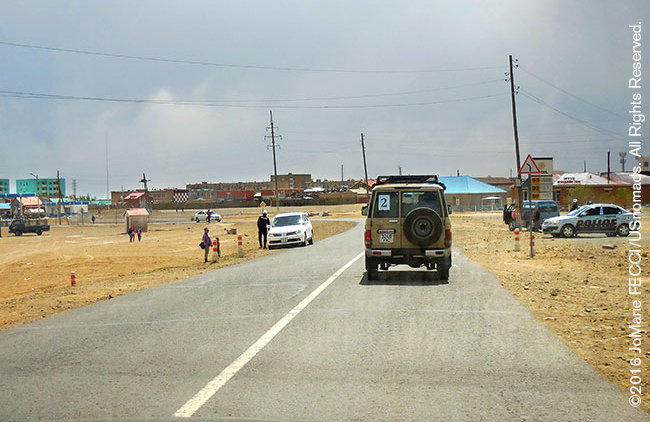 ULAANBAATAR TO TSAGAAN SUVARGA: Leaving the capital of Ulaanbaatar the team will travel almost due south into the province of Dundgovi to camp for the first evening about an hour’s drive from the Tsagaan Suvarga site. 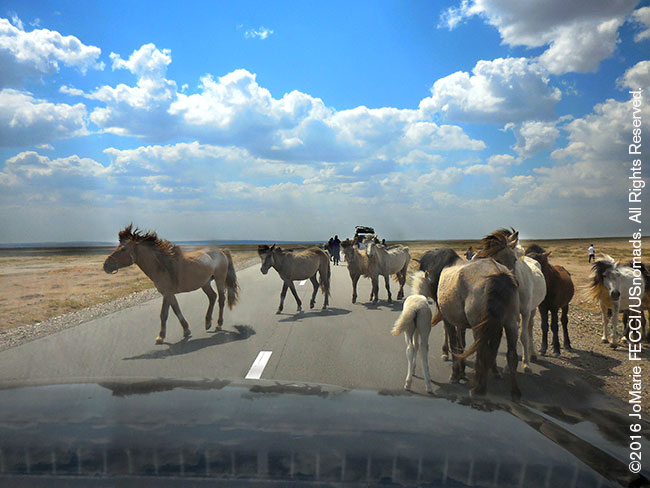 The first section of this long drive is on a paved highway through the more mountainous north that leads out into the rolling grasslands of the steppe and the approach to the Gobi desert. After roughly 175 miles the team will reach the town of Mandal Govi, the provincial capital. From there it is about 80 more miles south before turning off onto dirt, where we continue heading east for another 25 miles to reach our first ger camp. 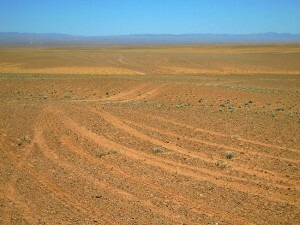 The arid conditions in the Gobi are attributed to the rain shadow effect caused by the Himalayas. Before the Himalayas were formed by the collision of the Indo-Australian plate with the Eurasian plate 10 million years ago Mongolia was a flourishing habitat for major fauna but still somewhat arid and cold due to distance from sources of evaporation. Considered the fifth largest desert on the planet, the Gobi actually contains five distinct ecological regions: the Eastern Gobi desert steppe, the Alashan Plateau semi-desert, the Gobi Lakes Valley desert steppe, the Dzungarian Basin semi-desert, and the Tian Shan range. 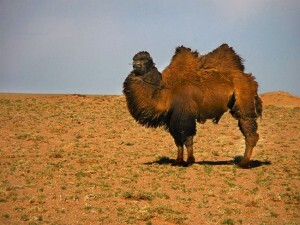 Unlike some deserts, the Gobi is not full of sand. Instead, the desert floor is mostly bare rock, due in most part to the high winds that whip across the plateau. Though there are some sand dunes, 95 percent of the desert is made up of this rocky terrain. There are few plants native to the Gobi, but the few that can survive here are some of the hardiest in the world. The saxaul tree, which serves as a reservoir of water and the saltwort shrub, which can survive in areas with ultra-high salt content are both uniquely adapted to this environment. 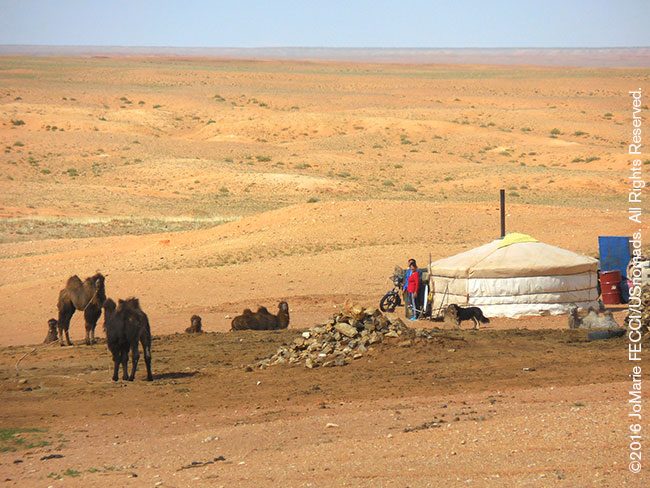 Almost every aspect of Mongolian society has been shaped by pastoral nomadism, a complex and sophisticated adaptation to environments marked by extremes. Mongolians herd sheep, horses, cattle, goats, camels, and yaks. Although horses are the most valued animal, Mongols actually depend on sheep for their basic livelihood. Each species of animal is herded separately, and herders must balance the expected benefit from each animal type against the cost of providing human labor to watch each separate herd and to move to the precise environment to which each animal is best suited. Sheep are basic, horses something of a luxury item, and other species are added to the camp inventory as labor power and environmental considerations dictate. The demands on human labor mean that a single household is not the optimal unit for herding. 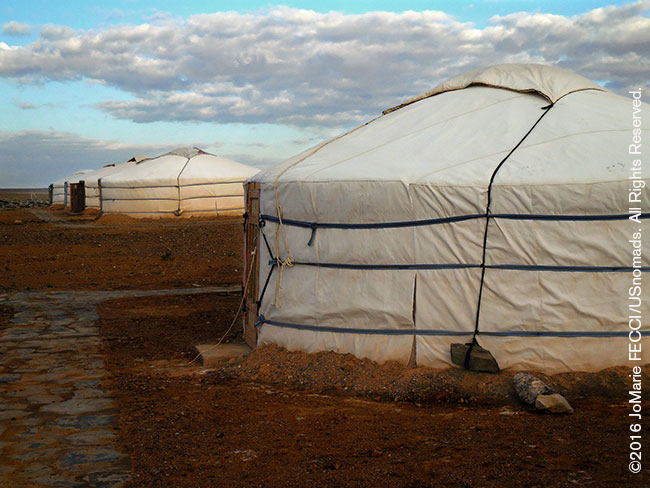 The basic unit in Mongol pastoralism is a herding camp, composed of two to six households, that manages its flocks as a single integrated economic unit. In the past, the members of a herding camp were usually, though not necessarily, patrilineal kinsmen. Membership of the herding camp was reconstituted on a year-to-year basis, with some households remaining in the same camp, others leaving to join different camps, and some camps dividing if their human and animal populations grew too large for effective operation. Under collectivization, herding camps remained the basic unit of pastoral production. Mongolian horses are best known for their role as the war steeds of Genghis Khan. Mongol horse archers were capable of feats such as sliding down the side of their horse to shield their body from enemy arrows, while simultaneously holding their bow under the horse’s chin and returning fire, all at full gallop. Mongolian nomads have long been considered to be some of the best horsemen in the world. 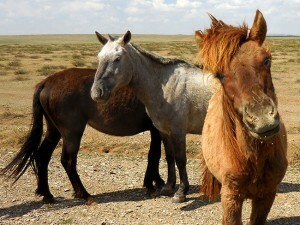 With more than 3 million horses, Mongolia’s equine population outnumbers the country’s human population and horses are considered the most prestigious animal to own. A nomad with many horses is considered wealthy. 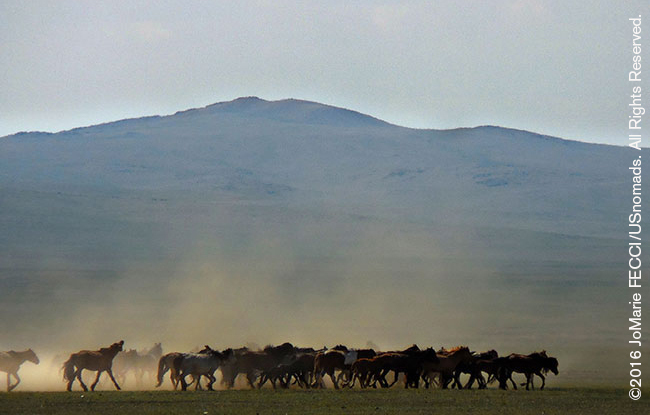 Horses are the focus of an elaborate cultural complex, and play a large role in the daily and national life of Mongolians. In Mongolian epics, the second lead is always the horse, which gives sound advice to the hero. In Mongolian chess, the most powerful piece is called the horse, rather than the queen. The national musical instrument is a bowed string instrument with a carved horse’s head, called a morin huur, which, according to legend, was invented by a rider who used the rib bones and the mane of his favorite horse to make an instrument to express his sorrow at its death. Fermented mare’s milk, ayrag, is the national drink. NOTE: This is the second in a series of segments highlighting locations and details of the OEX 2016 Mongolia Expedition. All text and photos are copyright JoMarie Fecci/USnomads unless otherwise noted. If you would like to use any of the imagery included here, please contact us for permission.